Create Eye Catching Christmas Cards Using Stampin' Up's! 2-Step Stamp Sets. Christmas cards come in all shapes and sizes, and the 2-step stamping available from many of the Stampin' Up! ® stamp sets is a fun way to create interest and individuality in your cards. I've used the timeless "Solemn Stillness" set for these cards and have shown how the 2-step technique can be varied to create different effects. You'll find the stamp set on page 30 of Stampin' Up's! 2008 - 2009 Idea Book and Catalogue. Browse through the entire catalogue online or order your own copy to save as a wonderful resource of ideas. All the images illustrated are life size so you know what you are getting, and at just $12.95 they represent fantastic value when you compare prices of other Craft Magazines with just a few ideas and lots of advertising! Heat Embossing with Silver Emboss Powder and the Stampin' Up! Heat Tool. Embossing on vellum and card stock. Using Silver Brads for embellishments. This was fun to try and although it is still a work in progress I thought I'd show you what I've come up with so far. 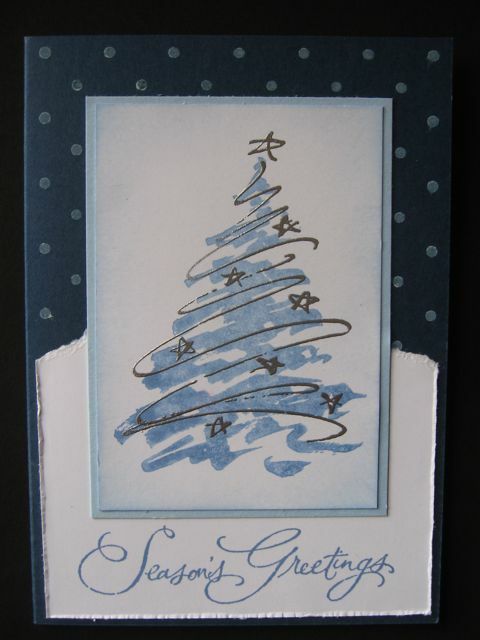 Card stock used is Whisper White, Bashful Blue and Night of Navy. Classic Ink is Brocade Blue. The greeting stamp "Seasons Greetings" is from the "Many Merry Messages" Stamp Set on page 111 of the Idea Book and Catalogue. 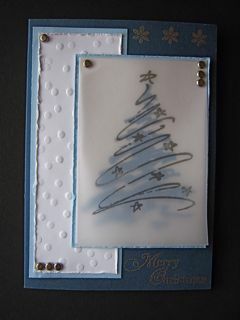 This is such a versatile set and covers many of the greetings for both the outside and inside of your Christmas Cards. Find out how you can always save a minimum of 20% on all your Stampin Up supplies. View examples of other Stamping Techniques.